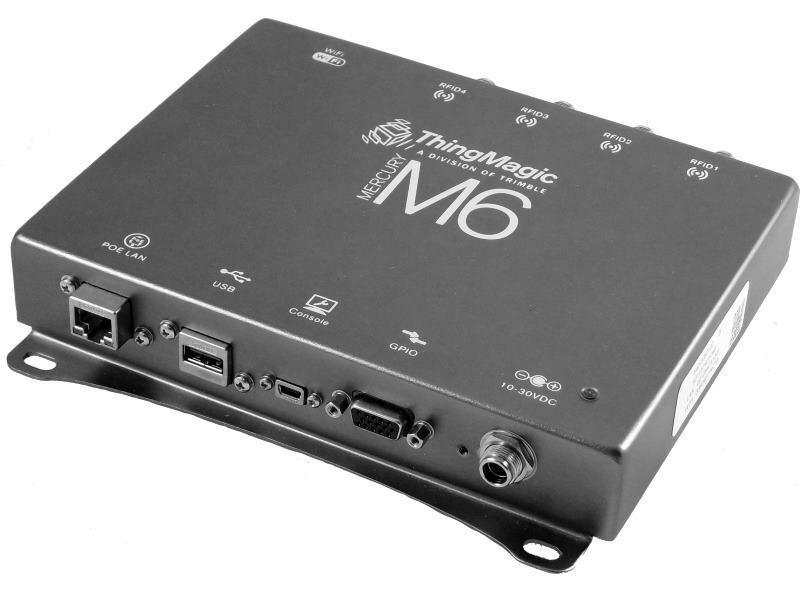 ThingMagic products are known for, the M6 offers a low-profile form factor, rugged service operating capabilities and the industry’s highest transmit power for a Power over Ethernet (PoE) capable reader. These features make the M6 well suited for enterprise, commercial and industrial environments where high performance in a wide range of operating conditions is required. Environmental rating – The M6 has an IP52 rating, providing dust ingress protection and water resistance for industrial, outdoor and rugged service requirements.Transmit power – The M6 operates at +5 to +31.5 dBm in both AC and PoE powered options, delivering superior performance for a wide range of applications. Tag read performance – Configuration flexibility supports high sensitivity and high throughput operations. Superior receive sensitivity allows for a long read range (30 ft) and a RFID tag read rate of more than 750 tags/second using high-performance settings. Wi-Fi network connectivity – An integrated Wi-Fi network option provides low cost integration with existing enterprise Wi-Fi networks and Wi-Fi security standards. At JADAK, we recognize the importance of managing product life cycles and allowing our customers sufficient time to plan when a product is at end of life. The ThingMagic Mercury6 finished reader has served our customers for more than 8 years but unfortunately, one of the key components of the Mercury6 finished reader is no longer available. Due to this component obsolescence, JADAK is forced to retire the ThingMagic Mercury6 finished reader. In light of this retirement, JADAK recently introduced a new product: ThingMagic IZAR – a 4-port UHF finished reader, which serves as a superior replacement of the Mercury6. The ThingMagic IZAR provides significantly better performance than the Mercury6 and comes at a lower cost. ThingMagic IZAR is an LLRP reader and also supports the ThingMagic Mercury API, which eases the migration path from the Mercury6 to the IZAR. Please see attached for the ThingMagic IZAR spec sheet. Last time buy orders for the ThingMagic Mercury6 finished reader must be received on or before September 31st, 2018. Please note that last time buy orders may not be cancelled, and all last time buy orders will be shipped on or before December 31st, 2018. As you’ve come to expect as part of JADAK’s commitment to service, we will honor all existing one-year warranties.